Commentaries published online in the New England Journal of Medicine and Annals of Internal Medicine suggest to think differently about breast cancer screening. In the first commentary, Nikola Biller-Andorno from University of Zürich and Peter Jüni from ISPM Bern describe how they became increasingly concerned when they reviewed the available evidence on mammography screening and contemplated its implications as members of the expert panel of the Swiss Medical Board. 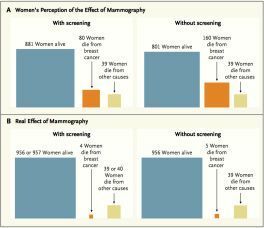 In the second commentary, Peter Jüni and Marcel Zwahlen of ISPM Bern discuss the conclusiveness of evidence about the benefits and harms of mammography screening and suggest that it may be time for another mammography trial. They argue that several trials showed inconsistent patterns of mortality and were therefore unreliable and suggest that the ultimate question for any cancer screening program is whether a reduction in cancer mortality really translates into saved lives.